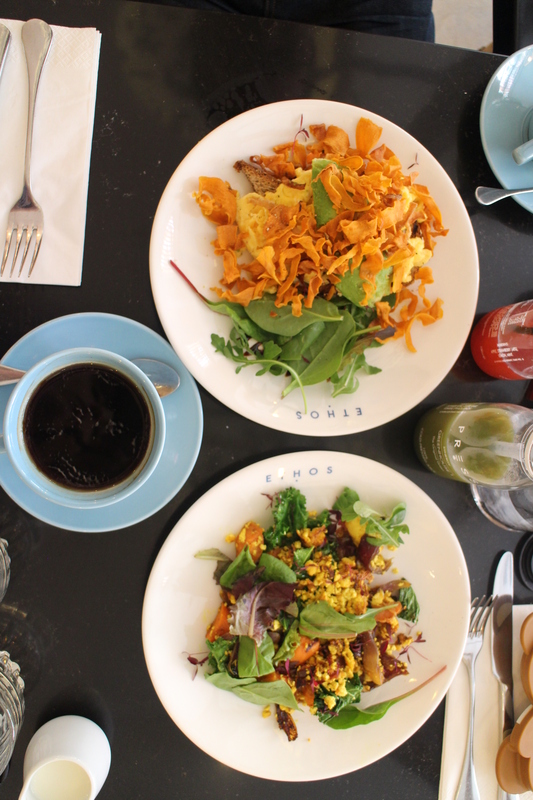 I’m not really sure when the custom of Brunch (quite literally a cross between Breakfast and Lunch) became a “thing” here in London…. but safe to say it’s a pretty massive “thing” and the choice now for Brunch spots here in our lovely City is seemingly endless. 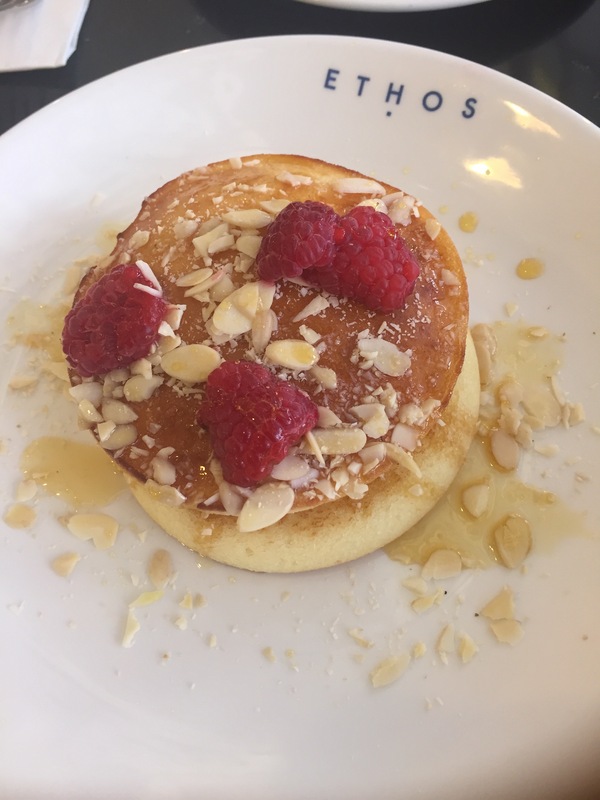 So when I heard that “deliciously different” Soho restaurant Ethos Foods were now offering a weekend brunch menu I not only went to check it out…. but got to interview Ethos’ incredibly inspirational owner, Jessica Kruger at the same time to ask her a bit more about this beautiful restaurant and its meat-free menu. Pictured here is just one of the delicious cooked-to-order Brunch items from the Sunday menu – Kale and Sweet Potato Hash sautéed in coconut oil with tofu and turmeric. Mouth watering yet? It should be! My husband had dairy-free scrambled eggs with sweet potato and onion crackling on gluten free bread and we then shared some raspberry, maple and almond pancakes. Totally gutted that we did….. because we should have ordered one each! The fluffiest, lightest and most delicious pancakes I’ve ever had (and they’re gluten free too). As well as traditional Brunch items like these, you can also opt to make your own choices from the hot and cold buffet – paying for your food by the weight of the food you put on your plate. There were several stunning looking salads on offer, as well as plenty of other dishes such as broccoli croquettes, spring green scotch eggs, risotto, curry… and even a dessert buffet too – many of which were refined sugar free. At one point I wondered if it would be rude to ask if we could stay there all day and eat our dinner at Ethos too as I wanted to try everything! In a city like London where new healthy eating hot spots seem to pop up every five minutes I was keen to ask Jessica a little bit more about Ethos Foods and how and why she set it up, and she very kindly obliged…..
Firstly, could you tell me a little bit about you, your background and your career prior to opening Ethos Foods? Sure. I grew up in Sydney, Australia, living there until I moved to Paris at the age of 20 for a university exchange. I studied a Bachelor of International Studies in Sydney and then did my MBA in Paris. I subsequently moved to Switzerland as I was offered a job there in corporate intelligence and then worked briefly in advertising. I moved to London to start Ethos. What made you decide to set up and open Ethos Foods? I changed my eating habits when I was at home one Christmas about 4 years ago. My mother (then aged 55) was preparing to move to California to work on a farm animal sanctuary for 6 months and I was like… “that’s great Mum, but ermmmm… why ??”. So i watched a documentary about animal factory farming to understand what she was doing and was truly shocked by the way our food is produced. So so cruel. I wanted no part of it, so I became vegan on the spot. I rarely ate meat anyway, so it was more just the cheese that was difficult to forego. (These days I am not a perfect vegan but am fully vegetarian). Going back to Switzerland, I was faced at every meal at which I ate out (which I did often) with a boring salad (aka bowl full of lettuce) or risotto or pasta (and I am careful with my carbs). So i started cooking for myself more, looking at vegan recipes online from American bloggers and thought – why do no restaurants have these sorts of foods on their menu ? Frustration lead to a “eureka” moment and I jumped in the deep end, having one investor back me, and started looking for sites in London. I moved to London to start the restaurant as it was clear London was much more forward thinking and likely to embrace meat-free food. I have no background in food but I care so deeply about it. I often describe myself as a sponge – just soaking up and learning as much as I can all the time. How long have you been open, and what do you see as the future for Ethos? September 2016 will be our 2nd anniversary ! It’s gone fast and slow. The future plans are to open more Ethoses – hopefully a few more in London and then also further afield in the UK in main cities. Fingers crossed ! Our goal is to encourage people to eat less meat by offering delicious meat-free meals. So the more cities in which we can do that, the closer we can get to achieving our big goals. What’s the biggest lesson you’ve learnt from opening up the restaurant? Gosh. So many lessons. But the most important is finding the right people – and for that you do tend to need to pay decent money. You can’t pay peanuts and expect a great team to assemble around you. The second most important thing is taking time each month to really examine your P&L and financial accounts. Drill down, ask questions, and act when figures are too high. What is your favourite dish on the Ethos menu and why? I love the cashew curried broccoli and carrot salad (sounds weird but trust me, it is delish) as well as the seaweed salad. My absolute favourite treat though has always been the bite sized peanut butter bomb. OHhhhhhhh ! Such indulgence and bliss. Not healthy at all but sooooo good. Apart from your own restaurant, where else do you like to eat in London? I really like the food they do at Redemption (Notting Hill and Shoreditch). The vegan food they do is exactly my type of food and because I only drink alcohol now on special occasions, their creative mocktails are a great alternative to plain and boring sparkling water that I would otherwise drink. Also I really like Japanese and Asian food in general. Sake No Hana in St James’ is an expensive treat on special occasions but it’s delicious. I eat a lot of Lebanese and Thai food when I go out as there are lots of vegan options. Often the local thai does great food. What would be your advice for anyone thinking of opening their own healthy eating business? Start! Just start. Learn. Research. Contact people who are in the industry who might be happy to speak to you for a few minutes over a coffee – but be ultra conscious and thankful for their time. But just starting and making steps is the most important part. Success will come through tenacity: never giving up despite the many, many set backs that will inevitably crop up.